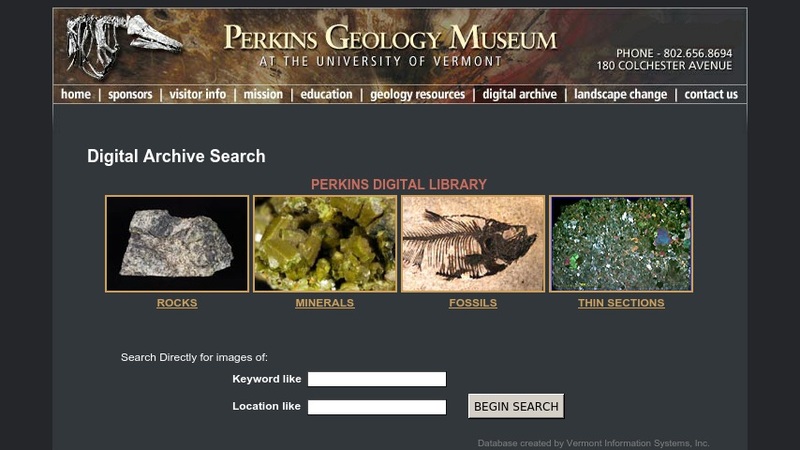 This online database contains thousands of digital images from the collections of the University of Vermont's Perkins Geology Museum. The collection emphasizes material from Vermont, but it also includes rock and mineral specimens, maps, slides, thin sections, and photographs from around the world. It can be browsed by type (rocks, minerals, fossils, or thin sections) or searched by keyword and locality. Each image is accompanied by brief metadata, including title, file name and catalog number, image resolution, and locality (where available).